My friends the friands are back. This time it’s with a bright pink fruity version. I give you my very own mini raspberry & white chocolate friands, made for after dinner nibbles with friends. Melted 60g unsalted butter in a small pan and left to cool. Crushed 50g raspberries in a small bowl with the back of a fork. Whisked 2 duck egg whites until frothy in a larger bowl. Whisked in 80g sifted icing sugar. Gently stirred in the melted butter and crushed raspberries. Stirred 30g buckwheat flour and 40g ground almonds. Stirred in 50g white chocolate chips. Placed a teaspoon of the mixture in 12 mini silicone cupcake cases. Placed a whole raspberry on top then filled the cases up with more mixture. Divided the remaining mixture between 4 larger silicone cupcakes cases. Baked for about 15 minutes at 180C until firm and well risen. Left to cool for a little, then turned out onto a wire rack to cool completely. Utterly scrumptious, these little friands had just the right balance of sweetness and fruity acidity. The juicy texture combined with the bright colour made these gorgeous to look at and just as good to eat. These were so moist they needed to be consumed on the day, but to be honest, this was not a difficulty. These are the other scrummy friands I’ve made so far. I am submitting these to the fabulicious Simple and in Season event. Having been on tour for a few months, this is now back home with Ren of Fabulicious Food. I’m also submitting them to Let’s Cook with Fruits, a one off event this month hosted by Simply Food. wow, look at the colour inside, that is incredible… I love the texture too… it’s time a made myself some friands… I think I need a special cake mould though no? Or can I do them in cupcake cases? Cupcake moulds are fine, that’s what I use anyway. oooh these look superb. 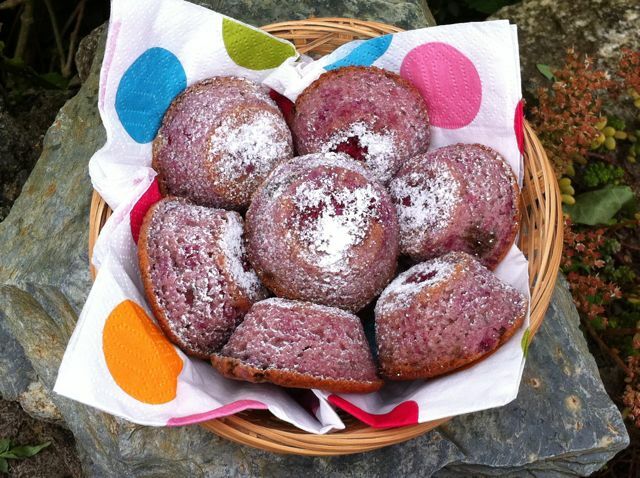 As you know I do love friands – am hoping to make some choc cherry ones for WSC if I dont run out of time! Oh do find time WLM – chocolate and cherry friands sound well worth having. Friands were a new discovery for me last year and a complete revelation. Dark chocolate and raspberry would taste great, but you wouldn’t get that amazing colour. Oh those look heavenly. It is the cut through one that nearly ended me. Mmmmmmmm!!! Wonderful and I want a friand mould too. I know they’re available in Australia maybe I need to investigate ordering. Hmmm, maybe I should give in too Jude and try and find myself some friand moulds. Not that they look at all bad as they are, but …….! Lovely, got any left over??! I bought a friand tin ages ago and only used it once, lol! Friands are still a bit of a novelty for me, but they were so worth finding out about. Wow these look fabulous and I love their colour and thats its natural!! Gluten free too – bonus! I’ve yet to make friands, but thye look so delicious. Katie, make friends with friands, they can be a great gluten free bake. Beautiful colour, they look soft and moist, my type of cake! I have never baked friands. Thanks Rita, I was rather taken with the colour too and they were delicious. If ever you have spare egg whites, friands are the things to make! Ahh, thank you Kate. The colour certainly caused a few oohs and ahhhs! Friands were a discovery for me last year Debs and now I’m a complete convert. I have a few others to choose from too – all have been good. Oh glad to hear you are a freind to frainds too 😉 Orange and poppy seed were the first ones I made. This must be the week for me to learn new French words. Yesterday I learned about the dariole mould, and now today: friand. Love it! Thanks BS, I totally agree. I love friand. These with raspberry and white chocolate must be divine. Angie, the only friand’s I’ve ever had are my own, so I’ve no idea how authentic they are – they are very tasty though. You are definitely the friand queen – I must remember this next time I have leftover egg whites! The colour is stunning – I hate using food colouring so love finding natural ways of getting really vivid hues! Err, yes, I have become a bit of a fan! I have some more I made for my birthday last month I still haven’t written up. I don’t like using artificial colours, so I’m always pleased when I can get something nice and bright. I’ve never made friands. These are such a wonderful colour. Raspberry and white chocolate is such a good combo! Do give friands a try. They are great for using up egg whites, but worth making even without the leftovers! look delicious I love them! Ahh, I expect that’s down to the fact I used whole raspberries as well as mashed up ones. I am yet to make friands although I bought a mould on a whim. Must try them sometime soon! And can’t help wondering if you’ve tried them yet Ros? These friands are a ‘must make’ given my love for raspberries (and of course CHOCOLATE!). They look very moist. You have to consume them within a day? Easy! They could be my friends any time. Like the blended raspberry idea. May try that next time.